Stories from the glory days of South African rugby and a look ahead at the 2015 Rugby World Cup contributed to the theme of leaving a lasting legacy for Madibaz rugby during the Bok Banter fundraiser at NMMU on Thursday night. A host of former Springbok skippers, World Cup winners and stalwarts from days gone by came together at their alma mater in support of plans to build a rugby clubhouse near the north-western edge of the Madibaz Stadium. Close to 600 guests attended the event at the Vodacom NMMU Indoor Sports Centre, which served as a fundraiser for the proposed R3.2-million clubhouse. “Legacies are hard to leave behind, but we hope to create a home for Madibaz rugby. A place where players from the past, present and future can come together to support their team,” said former Springbok scrumhalf Garth Wright. An auction of signed rugby memorabilia kick-started the fundraising effort and contributed R28 000 to the clubhouse construction. Wright was joined on stage by, among others, former Bok flanker and NMMU sports manager Bernard Petersen and recent international rugby hall of fame inductee Danie Gerber. They were followed by Bok skippers Hannes Marais and Andre Vos, and 1995 World Cup winners Hennie le Roux, Hannes Strydom and Garry Pagel, who were joined by 2007 winning team manager Zola Yeye. 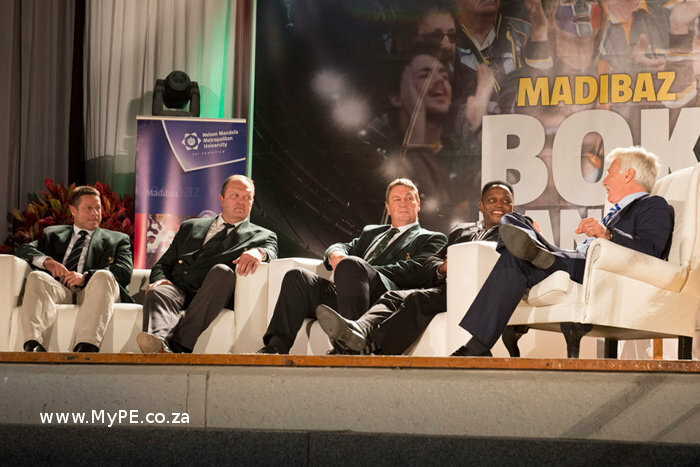 Television presenter Gavin Cowley, a rugby legend himself, played master of ceremonies and got the Springboks to share their knowledge and insights with the guests. Looking at the current state of rugby in South Africa former Bok centre Eben Olivier shared his concerns about a Springbok structure focusing more on size than skill, and the possible “over-coaching” of professional players. Old Bok forward Schalk Burger snr echoed this by saying rugby is a “socio-cultural extension of a lifestyle” and coaches should allow players to lose themselves in the game. “Then you will see the real players,” Burger said to applause from the crowd. Yeye emphasised the importance of balancing education with sport, saying that players should have something to fall back on after rugby, and adding that smarter people off the field made smarter players on the field. Looking at the current Bok squad, Yeye felt the selectors put too much emphasis on experience and did not balance it with enough young talent. When asked “to put their houses on the line” in predicting the outcome of the 2015 World Cup, only Burger backed the Springboks to bring the Webb Ellis trophy home. The majority backed the All Blacks, while Ireland and Australia also made the cut as possible World Cup winners.